SAN FRANCISCO, May 15, 2013 --African frogs, originally imported for early 20th century pregnancy tests, carried a deadly amphibian disease to the U.S., according to a new study published today in the journal PLOS ONE. African Clawed Frogs have long been suspected of introducing a harmful fungus called Batrachochytrium dendrobatidis or Bd to new populations that haven't been exposed to this pathogen before. The fungus has led to the recent decline or extinction of 200 frog species worldwide. A previous study found that the earliest case of Bd in the world was found in African Clawed Frogs in their native South Africa in 1934, but until now no research has tested for the disease among this species in populations that have become established in the U.S.
"We found that African Clawed Frogs that have been introduced in California are carrying this harmful fungus," said SF State biologist Vance Vredenburg. "This is the first evidence of the disease among introduced feral populations in the U.S., and it suggests these frogs may be responsible for introducing a devastating, non-native disease to amphibians in the United States." From the 1930s to 1950s, thousands of African Clawed Frogs were exported across the world for use in pregnancy tests, scientific research and the pet trade. These frogs will ovulate when injected with a pregnant woman's urine. "Today, these frog populations are often found in or near urban areas, probably because hospitals released them into the wild when new pregnancy testing methods were invented in the 1960s," Vredenburg said. Named for the claws they use to catch prey, these greenish-grey frogs live in pools and streams and have established feral populations in the U.S., including in San Francisco's Golden Gate Park. This is an African Clawed Frog (Xenopus Laevis). These frogs, originally imported for early 20th century pregnancy tests, carried a deadly amphibian disease to the US, according to a new study published in the journal PLOS ONE. San Francisco State University biologist Vance Vredenburg and colleagues have found the first evidence of the Batrachochytrium dendrobatidis fungus among introduced feral populations in the US. African Clawed Frogs are potentially potent carriers of the Bd fungus because they can be infected for long periods of time without dying, allowing them to pass it on to more vulnerable species. "It's amazing that more than half a century after being brought to California, these frogs are still here, and they still carry this highly infectious disease," said Vredenburg, associate professor of biology at SF State. "This implies that there must be a stable relationship between the pathogen and the frogs, whereas there are other frog species, for example in the Sierra Nevada, which have been wiped out by the pathogen." For this latest study, Vredenburg and colleagues tested museum specimens at the California Academy of Sciences. 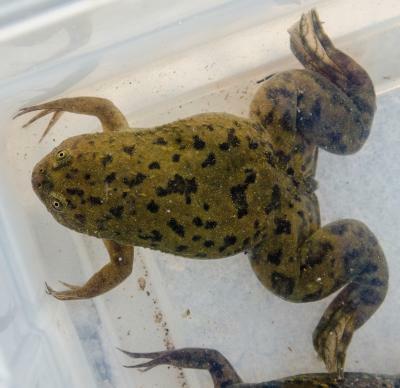 They assessed the prevalence of the disease by swabbing DNA from the skin of preserved African Clawed Frog specimens that were collected from wild populations in California between 2001 and 2010. They also tested archived specimens collected in Africa between 1871 and 2010 and found evidence confirming that Bd was present among indigenous populations of this species before they were exported worldwide. Although no longer used in pregnancy testing, African Clawed Frogs are still imported to the U.S. for use in biomedical and basic science research. Because of their suspected role as a carrier of the Bd fungus and other potential pathogens, eleven states in the U.S. have already restricted the importation of these frogs, for example by requiring special permits and not allowing them to be sold as pets. "Back in the 1960s, African Clawed Frogs were kind of ignored in terms of conservation research but now the damage has been done," Vredenburg said. "Now, we need to be cautious about other introduced species, including those in the pet and food trade. There could be other animals out there that are carrying diseases that we don't even know about yet."